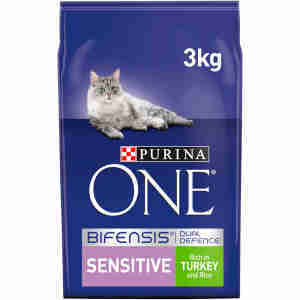 Purina have developed this feed with key ingredients to help you support your sensitive cat and help minimise discomfort associated with skin and stomach sensitivity, in order to help you both enjoy your life together at its best. The high quality ingredients make the formula tasty and also promote optimal digestion and ideal stool consistency. Ingredients: Turkey (18%), maize gluten meal, rice (15%), maize, pea protein concentrate, dried turkey protein, animal fat, dried chicory root (2%), digest, yeast (1%), minerals, fish oil. Why is it every time I re-order a product I am asked to review it? If my cats didn't like it, I wouldn't keep buying it. However this company does provide good value and speedy delivery. Just stop the constant review requests!!! Thought I would try a different cat food for a change and my cats seem to like this one!